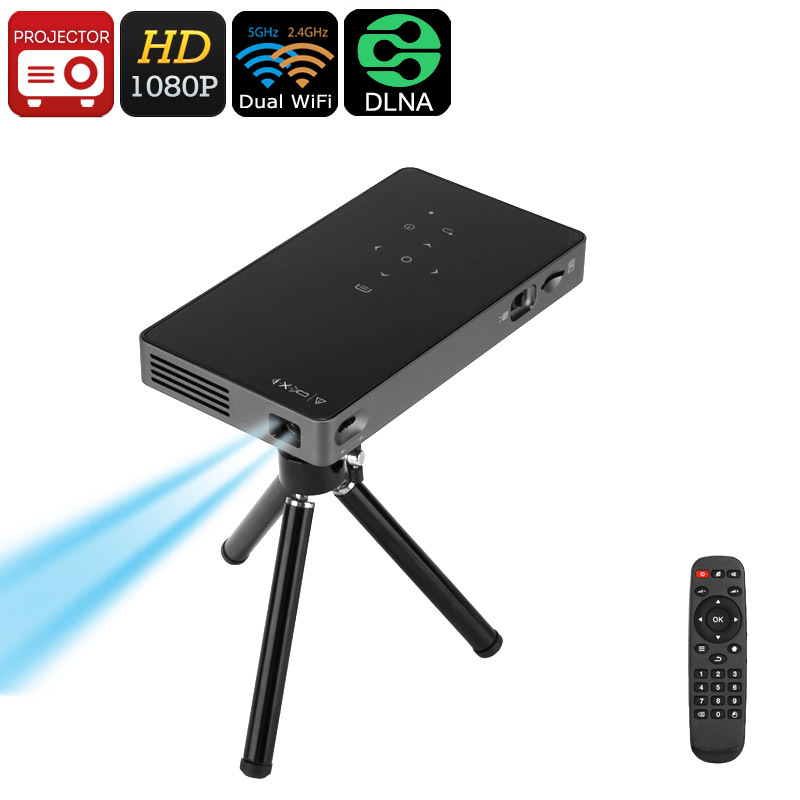 Successfully Added Android Mini Projector - DLP Technology, 1080p Support, Dual-Band WiFi, 100 ANSI Lumens, DLNA, Miracast, Bluetooth, 2W Speaker to your Shopping Cart. Put the power of Android into your living room with this Mini DLP projector. This mini projector runs on an Android operating system. Thanks to this, it is capable of doing so much more than simply projecting movies and presentations. With access to the Play Store, you’ll be able to download millions of free games, Apps, and films. All those media can be enjoyed while directly being portrayed on your wall as a large 120-Inch image. Whether you wish to throw a movie night for friends, or simply like to enjoy some games – this Android projector is sure to meet your demands. It comes with 8GB internal storage and the possibility to slide in external memory through its SD and USB ports. Thanks to its compact size, this mini Android projector can be easily carried around anywhere you go. It comes with a powerful 4500mAh battery. With this cell, you can even use your projector for up to 3 hours without having access to an external energy source. Additionally, it supports Dual-Band WiFi which lets you browse the web at lightning speeds. No matter where you’re at, from now on you’ll always be able to stream movies or download media. To increase your overall experience even further, your DLP projector comes with Bluetooth, DLNA and Miracast. By supporting 1080p files, your DLP projector lets you enjoy all the latest Full-HD films and series. It furthermore features DLP technology. This means that you’ll be treated to vivid colors and stunning detail. With this 100 ANSI lumen Android projector, you’re sure to enjoy a cinematic experience anytime you put on your favorite movie. It packs a Quad-Core processor and 1GB RAM so it is sure to handle all basic media including games. Thanks to its 2W built-in speaker, you can even use it without the need of an external audio device. Whether you use it for films and presentations, this Android projector is sure to meet your demands. This PLD Projector comes with a 12 months warranty, brought to you by the leader in electronic devices as well as wholesale Android projectors..